Or you can contact by phone at (503) 472-4987 if you have any questions. At the Eugene Airport Overflow parking lot. Time: 9am to ?? weather permitting. 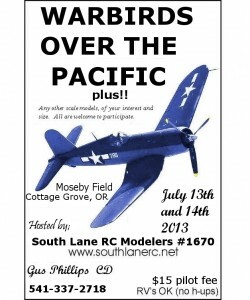 Umpqua Valley Modelers – Roseburg/Sutherlin, OR – R/C Float Fly! 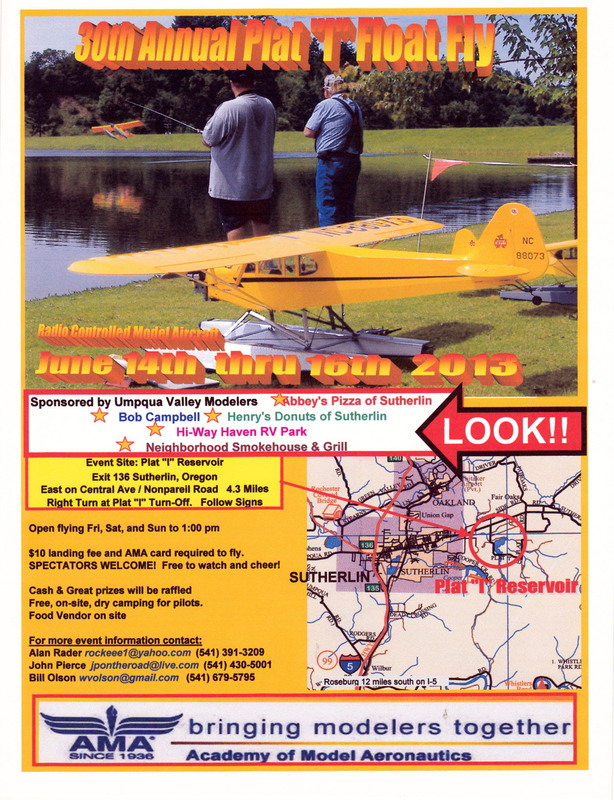 The Umpqua Valley Modelers of Roseburg/Sutherlin Oregon invites you and your club to participate in our 30th Annual Plat “I” Float Fly. The site is about 4 1/2 miles (all paved road) east from the Sutherlin I-5 exit 136. We look forward to seeing you at this year’s bigger than ever 30th Annual Plat “I” Float Fly. Bring your float plane, Float flying at nearby Agate Lake. 2.4 radio required for Agate Lake: shuttle provided. Time: 9am to 5pm weather permitting. 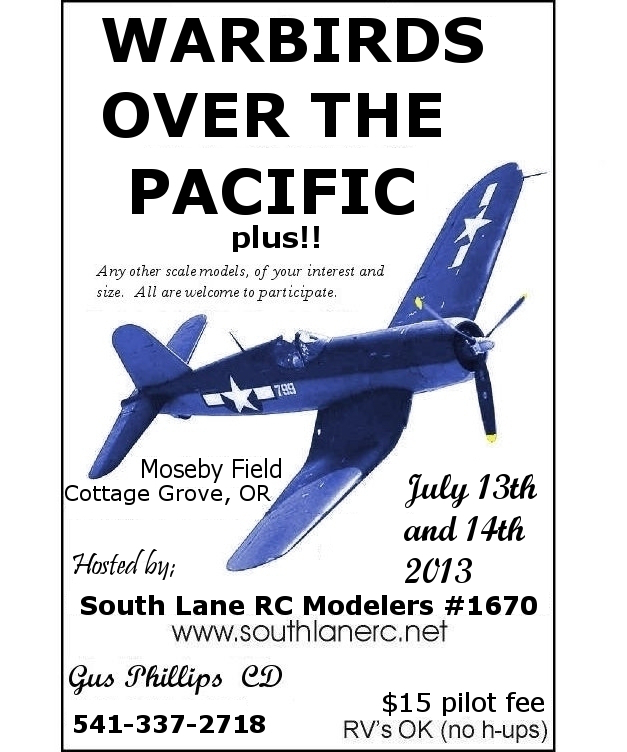 Warbirds Over the Pacific “plus” being held in Cottage Grove, Oregon. 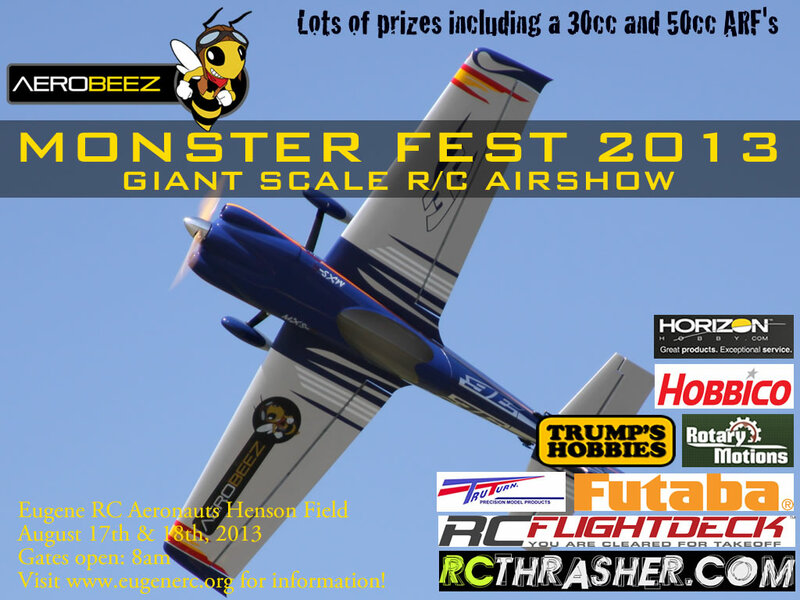 It is a fun fly event with a static scale judging performed by the general public. There will be a Pilot’s raffle for some lucky pilot who will go home with an 88” AT6 Harvard from KMP. We hope to see you there, this is one event you won’t want to miss. 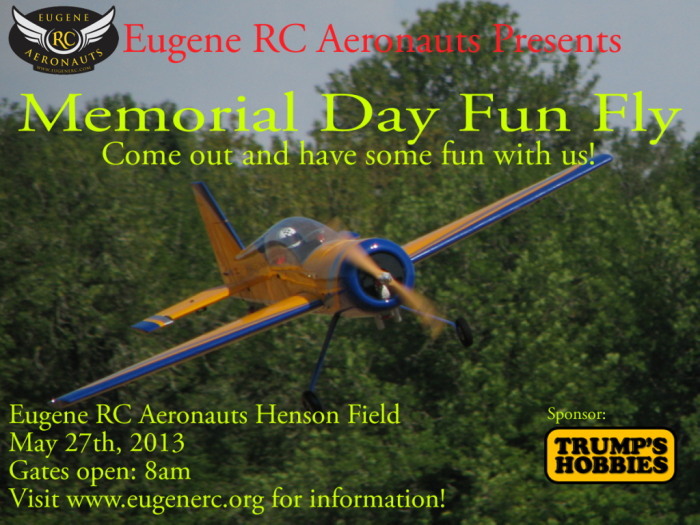 Please share the attached invitation to the McMinnville Aircraft Modelers’ July 13th fun fly with your fellow club members. We would appreciate an RSVP so that we can plan for the food accordingly. Hope to see you there. Time: 9am to 6pm weather permitting. � Paint ball shooting at a RC airplane. 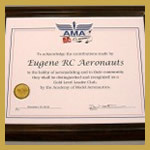 � There will be a landing fee of 2 CANS of food minimum for pilots. 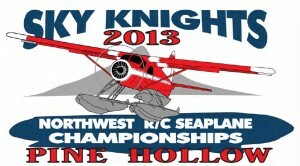 The Northwest Electric Fly-In will be held this year on Saturday and Sunday, October 5th & 6th in Spokane, Washington. 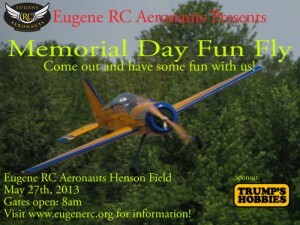 NEFI is an annual gathering of electric model aircraft enthusiasts from all around the Northwest. It’s a casual get together for anyone who is interested in radio control model airplanes, helicopters, and other flying things. There will be a wide variety of aircraft types to observe on the ground and in the air. Visitors and spectators are welcome. 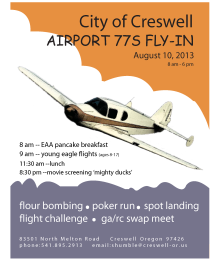 Pilot registration is $15. A nominal $1 per car donation to the club is requested from spectators. An air show at 12:00 noon each day will show just what an aircraft can do with a battery and an electric motor. There will be a large raffle of various modeling and general interest items. Beginners can fly an RC airplane with the assistance of an instructor pilot on a “buddy box.” RV parking is available for fully self-contained RV’s. Location is ten miles south of Spokane on Hwy 195 at Paradise Road (seven miles north of Spangle). For further information contact Dave Moore, 509-979-8786. www.ieqf.org. See flyer for a map and event details. Olympic Flight Museum, located in Olympia, Wa. 98501. It has taken a lot of work to put this new event together and because were getting a late start advertising it … time is of the essence. We would really appreciate your help in getting the word out to all your club members, local hobby shops … etc. and request that you put the “South Sound R/C Swap Meet” Flyer http://www.rcsouthsound.com/resources/flyer.pdf and information link http://rcsouthsound.com on your Club Site and also in your Newsletter in a timely manner …. only 4 weeks left to go! Also please check our site at: http://rcsouthsound.com for any and all information including; Online Table Reservations, Printable Flyer links (both PDF & Word), Printable Table Reservations (mail-in forms), Event Particulars and Personal Contact Information.